Limited edition giclée on paper. Printed on acid-free archival paper. Signed by artist Amy Beth Christenson! 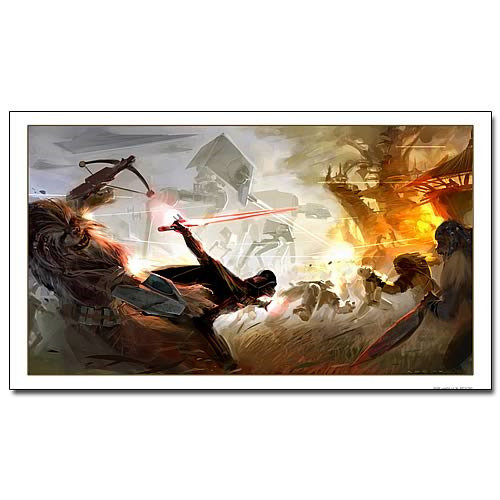 This brilliant, action-filled giclée on paper presents concept art signed by artist Amy Beth Christenson from the Star Wars: The Force Unleashed video game. Printed on acid-free archival paper, "Vader on Kashyyyk" measures 15-inches tall x 26-inches wide and is limited to merely 100 pieces. It's hand-numbered and includes a certificate of authenticity. Wouldn't you like to gaze on this breathtaking work of art every day? Item ships flat wrapped in clear thin plastic and covered flat by cardboard.